Back in October, my three English Teacher Counterparts approached me about an extra project they were recently “requested” to facilitate. The task came down from the Inspectorate for the schools of Prahova County. The Inspectorate is kind of like the Superintendent of Schools in the United States; its their job to make sure that all the schools in their assigned region run efficiently and cost effectively. As I understand it, every year a different school in the county is selected to host it’s subject specific colleagues for an educational session and sort of team building opportunity. With four weeks notice, our school’s English Department would be the lucky recipient of this privilege. Okay, so I teach in a high school where the students range in age from sixteen to twenty. I know, I know, “Twenty!” you say. Yep, but that is only because they start one year later here in Romania and we have some thirteenth graders that are on a specific five-year track. Anyhow, its no secret that I have been out of high school for more than a decade, so what could I possibly know about modern methods in testing? Even “No Child Left Behind” came out after my graduation. Well, luckily for me, I am part of a great network of Peace Corps Volunteers who have a variety of experiences, including recently teaching and administering in high schools in the States. After a cry for help on our group’s Facebook page, my inbox quickly filled up with a flood of useful information; I love crowd sourcing. Once my PCV colleagues put me on the right track it was a simple matter of some web-based research to fill in the details and after a couple of weeks I had the material I wanted to present. If I could have back all the time that I have spent sitting through mundane PowerPoint presentations with more information printed on the screen than words coming out of the speakers mouth, I could probably read War and Peace from cover to cover, and it would definitely be more interesting. So what’s the solution? A. As few words as possible on the screen and B. Prezi. For those of you that are not familiar with Prezi (nor was I until two months ago), it is a web-based application (though there is a desktop version) that allows you to take one large space or canvas and place images and content anywhere that you’d like. Once your content is on the canvas you can make it smaller or larger depending on your preferences, and you can control rotation. With the end result you have a fixed camera that follows a “path” from topic to topic, zooming in and out and twisting to fill the screen. You can find tons of great examples at Prezi.com or watch mine below. I equate the experience as more like being on a presentation roller coaster than simply jumping from slide to slide like in PowerPoint. There was one small roadblock though, I knew how to use PowerPoint but had no idea how to use Prezi, and herein lays one big reason no blogging took place for almost two months! The good news is that Prezi is relatively user-friendly, simple and self-explanatory, though there were certainly moments where I wanted to throw my prized laptop under a caruța. In the end I invested about twenty hours in creating the presentation, but I’m glad that I did. Even though my participation in this project wasn’t required my colleagues seemed appreciative of my volunteering to help out. As a result my part was the only that actually covered the subject topic. The unfortunate fact of the matter though is that without more funding and infrastructure there is no way that Romanian schools could carry out these solutions. The best that we can hope for here is that the seeds of change has been planted. 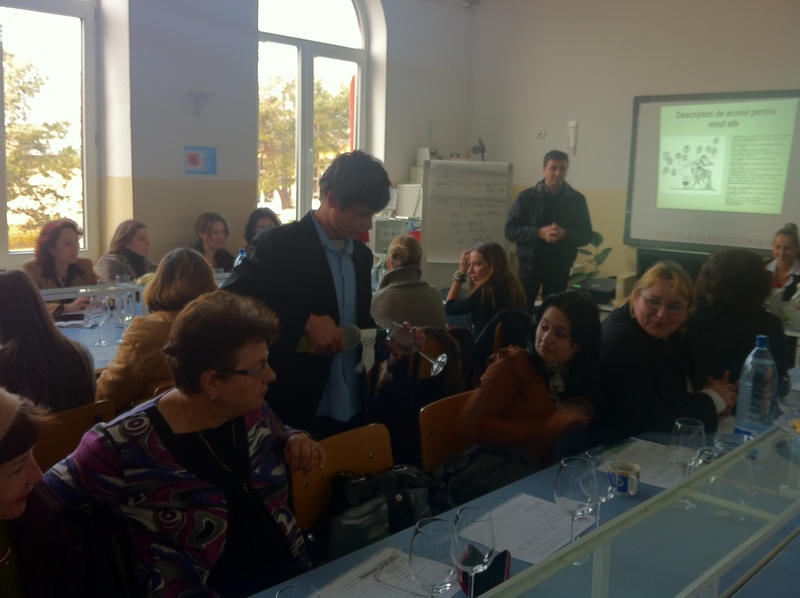 After the academic aspect of this event we moved our thirty or so guest teachers into a nearby classroom and treated them to a wine tasting. A representative from our local Rovit Winery came by to give an introduction to the wine region of Valea Călugărească and to explain the differences in the wines they were about to taste. Some of my students from 11C helped with the actual pouring. When viewing this recording keep in mind that it is a video capture of my computer screen and does not give you the same control to advance through the topics as you would using the Prezi viewer. The show is about six and a half minutes so don’t feel obligated to watch the whole thing.